With Bloom's first spring right around the corner, it would just be wrong do deprive this site of all the gardening projects we have planned. Plus, pro tips abound now that Elizabeth's busy becoming a horticultural whiz with her position at Native Nurseries. Our garden section seeks to guide you through future outdoor planting projects, farming your own produce, designing floral bed arrangements, choosing the right compost for your crops, on and on we could go! Guest experts, inspiring friends, and helpful resources will join us in sharing each story. If anything, hopefully this will at least encourage you to begin a new relationship with the natural world. C'mon, let's welcome spring the right way this year and get a little dirty with our hands. No tacky garden accessory required. The window of opportunity is quickly drawing to a close for this season's chance to get yr bulbs in the ground. But rather late than never, right? We're starting off our garden section with what it takes to start a garden - bby bulbs! Ideally, bulbs should be planted at least six weeks before hard, ground-freezing frost can be expected in your area. The bulbs need time to root and establish themselves. 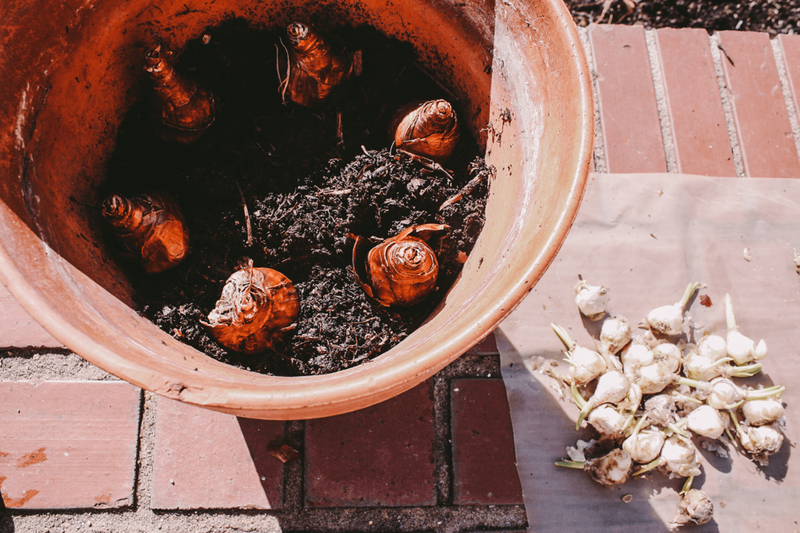 On the other hand, planting bulbs too early can lead to fungus or disease problems. So a good rule of thumb is to plant bulbs when the average nighttime temperatures in your area are in the 40-50 degree range. At that point, the soil temperature should be just right for tucking bulbs in for their winter's rest underground. If you miss planting your bulbs (like me) at the optimal time, don't wait for spring or next fall. Bulbs aren't like seeds. They won't survive out of the ground indefinitely. Even if you find an unplanted sack of tulips or daffodils in January or February, plant them and take your chances.. especially with this Polar Vortex debauchery. A suggested alternative would be potting them up, hence they stay a little cooler in containers vs. the underground. At least they're better off given it a fighting chance in a chilled pot than wasting away in your garage. After fall, flower bulbs are survivors by nature's design. Bulbs shown below: Erlicheer, Narcissus, Hyacinths, and Tulips. 1. Before planting, choose your bulbs wisely. The bigger the bulb the larger the flowers they'll produce. Inspect bulbs carefully, making sure that they look clean and are free of mold. They should be firm with no soft spots. 2. 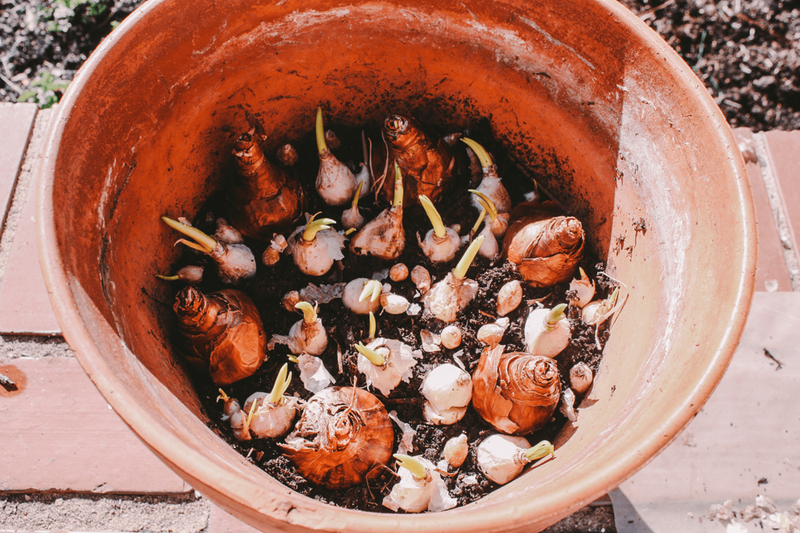 When you're ready to plant the bulbs, start with well-draining, loosened soil; bulbs are susceptible to rot when planted in poorly drained sites. Also be sure that this site will have partial to full sun exposure. 3. 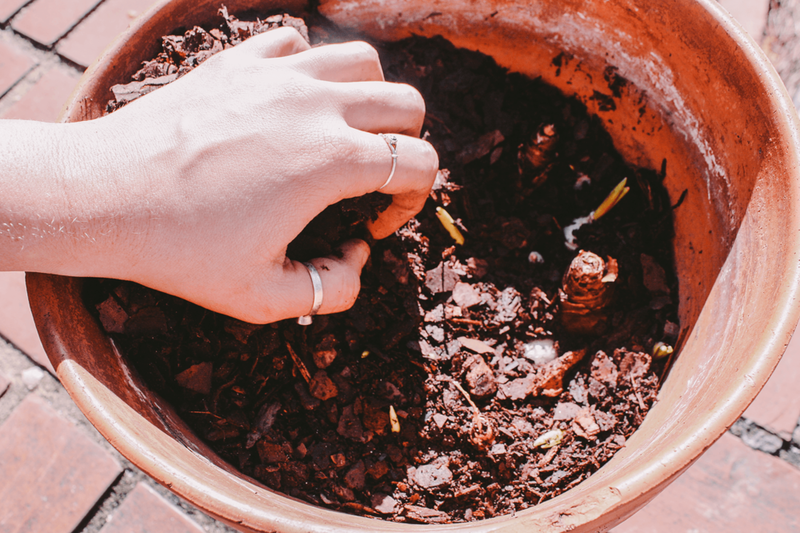 After the planting site has been prepared, lay out the bulbs in the desired planting pattern and plant them in the ground four to six inches deep**. 4. Plant the bulb with the pointed tip facing up. I like to plant bulbs in random order for a more naturalized appearance. 5. Water occasionally to avoid water logging the soil. After plants are finished flowering in spring, cut back flower stalks but allow the leaves to die back naturally. **As the bulbs grow, their roots will grow deeply into the soil so that they stand strong and tall, and the wind and rain won't blow them over.